Thomas Jessep was born on 1 November 1848 at Gooderstone, Norfolk, England, the son of farmer Thomas Jessep and his wife Jane, née Cooper. He married Louisa Drury of Cockley Cley, Norfolk, at Surry Hills on 10 April 1873. He died at Waverley on 7 November 1916, survived by four daughters and three of his four sons. Thomas Jessep arrived in Hobart in 1854 with his mother and brother. He worked in an orchard and on the Ballarat diggings in 1866 before arriving in Sydney in 1869. He became a wholesale fruiterer, establishing Thomas Jessep & Son. He was a commission agent for intercolonial, New Zealand and Fijian producers. He was a foundation member and first Chairman of the New South Wales Fruit Exchange Co-op Company and President of the Fruit Merchants’ Association of NSW. Thomas Jessep built Norfolk House at Waverley. 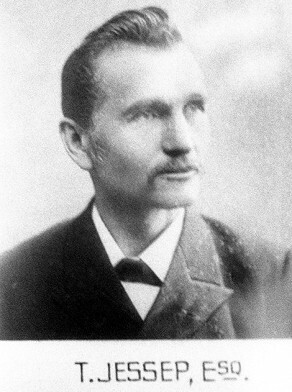 Thomas Jessep was the Commissioner of Melbourne Centennial Exhibition in 1888 and the Chicago Exposition in 1893. He joined the Loyal Orange Institution in 1870. He was Grand Secretary of the Grand Lodge from 1883-85, 1911-12, and in 1915, becoming Deputy Grand Master 1886-88 and Grand Master in 1889. For many years he was the Director of the Protestant Hall Company. He was also a member of the Australian Protestant Defence Association in 1901. He was the Secretary of the NSW Total Abstinence Society in 1871. He was a member of the Methodist Evangelical Council, a lay preacher, and Superintendent of the Waverley Methodist Sunday School. Thomas Jessep was elected MLA for Waverley, 1896-1907, as a free trader. Jessep was an Alderman of Waverley Municipal Council, between 1889 and 1892. A moral reformer, Jessep was Alderman of the Sydney City Council for Brisbane Ward from 19 October 1893 to 6 December 1900. He was a member of the Works Committee 1900, the Garbage Disposal Committee 1900 and the Fishmarkets Inquiry 1898-99. Mark Lyons, ‘Jessep, Thomas (1848–1916)’, Australian Dictionary of Biography, National Centre of Biography, Australian National University, http://adb.anu.edu.au/biography/jessep-thomas-6846/text11857, accessed 7 January 2013.